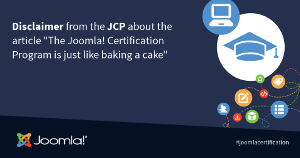 DISCLAIMER from the Joomla Certification Program (JCP) regarding the blog post "The Joomla! Certification Program is just like baking a cake"
JandBeyond will take place next month. This great event will be held this year in Cologne, the fourth largest city in Germany, located within the Rhine-Ruhr metropolitan area. Because of its geographic location, the city can be easily reached from multiple airports, by train and by car. This is an excellent opportunity to learn, meet the community, and also to get Joomla! certified! 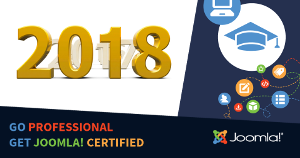 2017 has been a very important year for the Joomla! Certification Program. It has been the first complete year in which the Program has been active, after the launch late in 2016. It's been a great year, with a lot of learning. 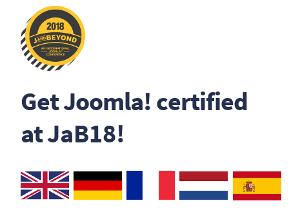 We have certified 108 Administrators from 15 countries, in sessions that have taken place in JUGs, JoomlaDays and Joomla! Learning Partners. 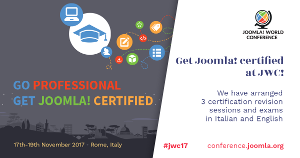 We have reached a milestone, with the first multilingual exam, English and Italian, that was held at the Joomla World Conference in Rome. As everybody knows, Rome has a long history, amazing events and iconic buildings. There is the Colosseum, the old city ‘Foro Romano’, the Pantheon and much more. It was a great city to host the Joomla! World Conference 2017. A unique gathering for Joomlers from all over the world. The Joomla! Certification Team was delighted to add another chapter to the history of Rome. 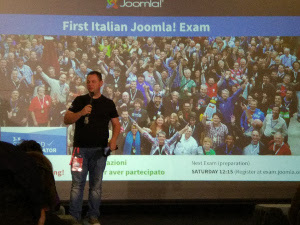 JWC hosted the first ever Joomla! Exam in a non-English language. Your Joomla! Exam at JWC17 with a discount! When in Rome… do like the Romans, like visiting the Colosseum, The Vatican and the Trevi Fountain. When at Joomla! World Conference… do the Joomla! Exam. First multilingual certification exam in Rome! The United States of Joomla! Subscribe to our newsletter and stay informed on the latest developments of the JCP.